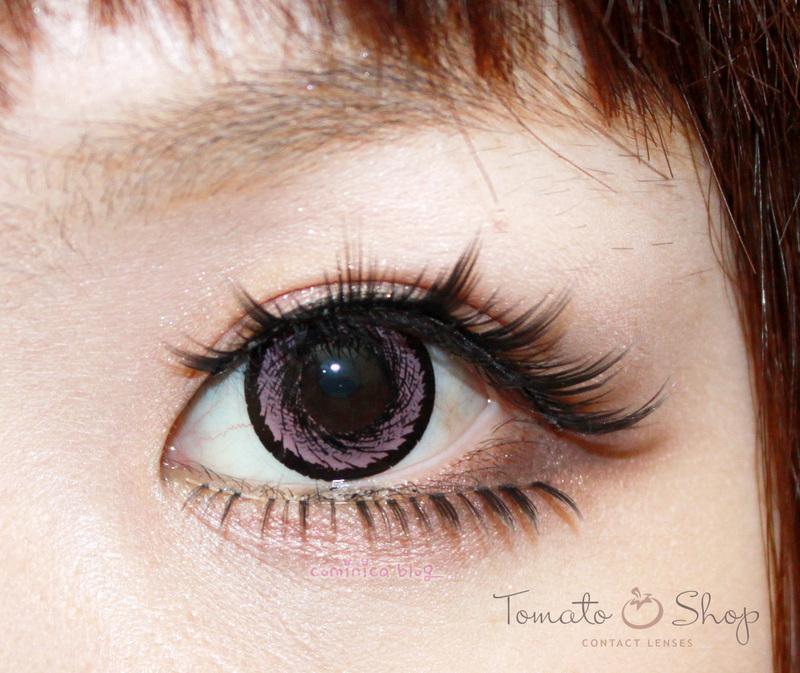 Now, I'm back with a Circle lens review which kindly sponsored by Tomato Shop. Tomato shop sell affordable and original Geo lens which based in Indonesia. Check out their site here. This time, it's CUTE PINK contact lens （⌒▽⌒）and the pattern is somehow remember me of the Hurricane series. Got cute lens case together with every purchase! This is the look on my eyes, this lens is not recommended for daily use. Because, the pattern will look too festive if you don't wear an eye make up. (right-click+new tab to see it more closer). But, with a suitable make up, this lens look so pretty and cute. Make my eyes look more bigger and I'm pretty happpy because the pink color is showed on my dark eye. XD And it has a black ring on the edge which make my eyes look bigger and more pop when use ◕ ‿◕. This contact lens is nice for a romantic look and match with your pastel oufit. About the comfort, this is just like my previous Geo Morning Glory Gray which I reviewed here. The comfort is quite good but feel dry if wear it on AC room for hours. But, for a photo shoot or cosplay, or just a short event, this lens is great. I love Pink color, it's so fun to wear sometimes if I wanna look sweet and more 'anime' feeling. lmao XDD And I love how the color really show on my eyes. The circle and swirl pattern is really unique, from far away it looks like a pink circle ring inside your black eyes. Really pretty. This contact lens does give an larger effect on my eyes, it looks dolly and kawaii~~. 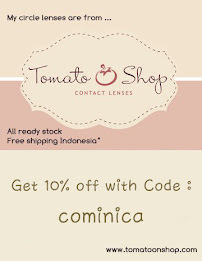 If you are living in Indonesia and looking for a contact lens shop with affordable price and original, you can visit Tomato Shop and use coupon code : COMINICA to get a 10% discount. 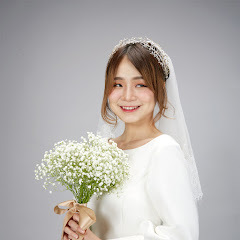 Lately, I'm so addicted with my android phone ≧△≦ , Ive been editing my pictures with the application I download from Android Market, mwahahaha. My fave applications are, shibuya camera, deco pic, pics art, etc. The application is so kawaii~ it's like playing with puri-kura ,but still the number 1 photo editing application is Adobe photoshop XD. and I'm thinking to include it on my giveaway too, hehe this will be a Kawaii giveaway stuff to thank you all of you ladies. I hope you will like it, please don't expect for expensive make up brand, lol I'm not rich ;_; but I'll include few make up stuff too, and I'll add some false lashes (of course!) XD, I'm still preparing all the prizes now, I'm so busy at the moment. -.- Got a Business Logo request from someone (Yeah, I'm Graphic Designer too -_-), and need to make it since I need to be professional. Glad that you are back now! 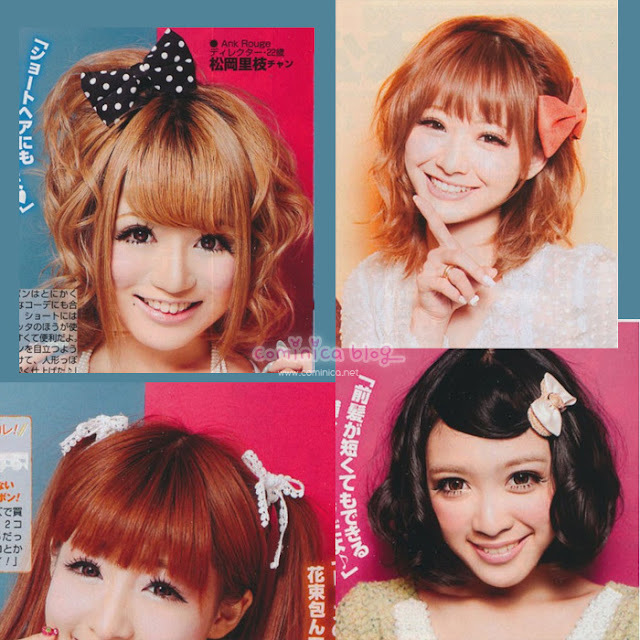 Besides your pretty circle lenses, I can't help but notice your hair is so pretty! : D Bows are really so cute! Those lenses are very pretty. They look great on you. Love pink lenses on you cominica <3 ;) Pretty pretty! Aww, the lenses look so nice on you! OMG!! I so love the pattern!! WOW WOW!! So cute the lenses,I have a good friends that are looking for some lenses like those for "louise" (Zero no Tsukaima) cosplay! Are these the same as the (i.fairy) hanabi pink ? 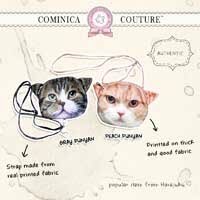 because on pinkyparadise (http://www.pinkyparadise.com/product_p/g19-hanabi-pk.htm) it's under vassen not geo. I really want to get these but im wondering if they're the same.